Royal Caribbean Announces Explorer of the Seas 2014 Cruises From Cape Canaveral. Royal Caribbean International today announced new Caribbean cruises for Explorer of the Seas from November 2014 through early January 2015. After eight consecutive years dedicated to the New York metropolitan area with year-round sailings from Cape Liberty Cruise Port in Bayonne, N.J., Explorer of the Seas will redeploy to Port Canaveral, Fla., to offer a range of four- to nine-night Bahamas, and Western and Southern Caribbean vacations. Throughout the short season, Explorer of the Seas will join Freedom of the Seas and Enchantment of the Seas at Port Canaveral to offer the most ships and itinerary options to The Bahamas and the Caribbean from Central Florida’s Space Coast. Guests aboard each ship will enjoy a Caribbean-holiday vacation that only Royal Caribbean can deliver, with the cruise line’s award-winning family programming, industry-leading entertainment and world-renowned friendly and engaging GOLD Anchor Service. Explorer of the Seas’ 2014 holiday season cruises from Port Canaveral are now open for sale. Explorer of the Seas is among the Voyager class of ships, which first introduced innovative and iconic Royal Caribbean onboard amenities, such as Studio B – a real ice-skating rink, a rock-climbing wall, an in-line skating track, and the Royal Promenade, a four-deck high boulevard that runs nearly the length of the ship. The Royal Promenade is lined with boutiques, lounges and a café and comes to life with colorful parades during the day and themed dance parties at night. Guests also can delight in professional ice-skating productions in Studio B and Royal Caribbean’s award-winning Broadway-style musical revues in the Palace Theater; try their luck in the Casino Royale; and dance into the night in The Chamber nightclub. Young guests, ages three to 11, can join in Royal Caribbean’s award-winning Adventure Ocean kids program, while teens, ages 12-17, have their own exclusive space. College-accredited counselors lead ongoing entertaining and educational sessions from 9 a.m. to 2 a.m. in five age groups. Kids will enjoy the Adventure Beach splash pool and teens can hang out with their peers in the teens-only Optix lounge. From close encounters with the rich wildlife both on land and below the sea, to enriching tours of cultural and historic landmarks, to exciting adventures into the lush terrain, Royal Caribbean’s expansive array of shore excursions help guests make the most of their Caribbean port of call and create long-lasting memories for every member of the family. No matter which Royal Caribbean shore excursion they choose, guests can rest assured that their guides and tour operators are reputable, experienced and insured. On select itineraries, guests call at two destinations highly rated by guests, CocoCay, Royal Caribbean’s private island paradise in The Bahamas, or Labadee, the cruise line’s private beach destination on the north coast of Haiti. Guests can choose a wide range of watersports options on beautiful sandy beaches and enjoy a sumptuous seaside barbeque. Labadee also offers a range of activities for thrill seekers, who can soar 500 ft. down the mountainside on the Dragon’s Breath Flight Line, the longest zip line over water; twist and turn down the same mountainside on the Dragon’s Tail Alpine Coast; or beat the heat on the new 300 ft. long Dragon’s Splash Waterslide. 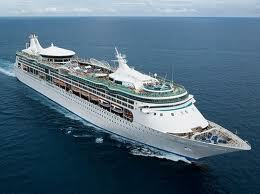 Explorer of the Seas will sail four Western Caribbean cruises roundtrip from Port Canaveral through Jan. 4, 2015. On these five-night itineraries, guests call at Cozumel, Mexico, and Nassau, The Bahamas, or CocoCay and Cozumel. Vacationers also can choose two Southern Caribbean sailings on a nine-night itinerary that call at each of the ABC Islands and Labadee. Additionally, a five-night Bahamas cruise, departing Dec. 13, 2014, will call at Nassau, Grand Bahamas Island and CocoCay. Guests on a special four-night sailing, departing Dec. 23, will call at Labadee on Christmas Day. The following eight-night Caribbean itinerary will herald in the New Year in St. Maarten, as well as call at San Juan, Puerto Rico, St. Croix and Labadee. Vacationers also can choose an extended 14-night Southern Caribbean itinerary, departing Nov. 1, 2014, which repositions Explorer of the Seas from Cape Liberty to Port Canaveral via the Southern Caribbean. From Port Canaveral, vacationers also have Royal Caribbean’s Freedom of the Seas and Enchantment of the Seas from which to choose. Freedom of the Seas, with its iconic FlowRider surf simulator, will continue to alternate seven-night Eastern and Western Caribbean itineraries and Enchantment of the Seas will offer three- and four-night Bahamas getaways. Royal Caribbean Announces Quantum of the Seas Coming to New York An Unveils Amenities. Royal Caribbean's New Quantum of the Seas Sets Sail From New Jersey in the Fall 2014.
International today unveiled first details of the next generation of cruise vacations – Quantum cruising. The Quantum class of ships will take a dramatic leap forward, introducing more game-changing “firsts at sea” such as a skydiving experience, a thrilling adventure that transports guests more than 300 feet in the air on a breathtaking journey; cutting-edge transformative venues including the largest indoor sports and entertainment complex at sea with bumper cars, roller skating and more; and the cruise line’s largest and most advanced staterooms ever. These new, larger staterooms enable innovation in design, storage and comfort including the industry’s first virtual balconies. Every stateroom on Quantum of the Seas will have a view. The much anticipated details were unveiled by stage, television and film star, Kristin Chenoweth – Godmother of Quantum of the Seas – at an exclusive event for media and special guests in New York City this morning. A revolutionary concept, Two70° is a multi-level great room that is sure to become one of the most iconic venues onboard Quantum class. The space is aptly named for its magnificent 270-degree panoramic sea views through vast, floor-to-ceiling glass walls spanning almost three decks at the stern of the ship. Two70° seamlessly fuses entertainment and technology to create a transformative journey from day to night. The perfect setting to connect with the sea during the day, Two70° provides a modern and comfortable living room space for guests to sit back and relax. As the sun sets and the lights go down, the dazzling space gradually reveals its evening persona, delighting guests with spectacular, mysterious and unexpected entertainment at night. Unparalleled technology means every show at Two70° is multidimensional and immerses the audience through a combination of live performers, including aerialists, as well as breathtaking video and digital scenery. The largest indoor active space at sea, SeaPlex is a distinctive and flexible sporting and entertainment venue with thrilling new features that will inspire guests of all ages to let loose and connect with their playful sides. Delivering more first at sea experiences, guests can experience a circus school with flying trapeze, or play basketball on a fullsize regulation basketball court. By night, the first-ever bumper car and roller skating offerings deliver fun and excitement. Or, guests can dance to music orchestrated from a floating DJ booth which hovers above the activity below. A performance hall and the hottest live music venue on Quantum class, Music Hall is the place for guests to enjoy intimate and exclusive access to live performances, DJs, theme night parties, billiards and more. Rebellious and edgy, Music Hall’s two-story design is inspired by the spirit of rock and roll. With guest comfort and convenience in mind, Royal Caribbean debuts the most spacious and luxurious accommodations ever, introducing rooms that on average are nine percent larger than those of Oasis class ships. Sophisticated, upscale design, layouts and finishes create a home away from home. Boasting Royal Caribbean’s new smart design concept, each stateroom features contemporary designs with easy-to-use customizable layouts and intuitive larger storage solutions. With Quantum of the Seas, Royal Caribbean introduces the largest variety of stateroom categories, including new Studio staterooms, some with balconies for single travelers, three Junior Suite categories and larger Loft Suites. The adults-only Solarium, along with an outdoor pool, a new indoor pool with operable roof and a H2O Zone kids’ aqua park, will be featured on the top deck. Signature Royal Caribbean venues and experiences popular with families such as the Rock Climbing Wall; FlowRider surf simulator; the award-winning Adventure Ocean children’s program; the Royal Babies and Tots Nursery; and the DreamWorks entertainment and events featuring the characters from animated movies: Shrek, Kung Fu Panda and Madagascar; will all be back on Quantum class. Quantum of the Seas and Anthem of the Seas also will make a quantum leap forward in its culinary offerings providing the most flexible dining options and more specialty restaurants than ever before. Additional details about dining, entertainment and other unexpected features and amenities on Quantum of the Seas will be unveiled in the coming months. 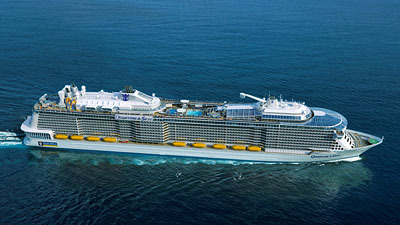 Quantum class will debut in fall 2014 with Quantum of the Seas, followed by her sister-ship Anthem of the Seas in spring 2015. Quantum ships span 16 decks, encompass 167,800 gross registered tons, carry 4,180 guests at double occupancy and feature 2,090 staterooms. Quantum of the Seas will sail out of the New York Harbor from her homeport of Cape Liberty on 7- to 12-night itineraries during the winter 2014/15 season. Bookings are now open. Since then, the ship has been in the Grand Bahamas Shiyard undergoing repairs. 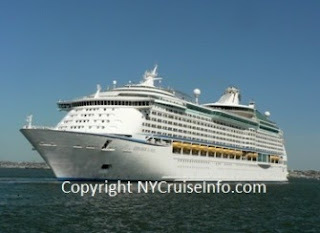 The fully restored Grandeur of the Seas arrived in Baltimore on Wednesday (7/10) after undergoing 6 weeks of repairs. Upon arriving in Baltimore, she sailed on an overnight cruise for the media, and travel agents to showcase the ship. The Grandeur will resume her regular cruise schedule from Baltimore starting today - July 12. Current schedules have the Grandeur of the Seas deparing Baltimore though April 2015. Carnival Cruises Varies Carnival Splendor 2014 Cruises - Including 1 Way Cruises between New York and San Juan. 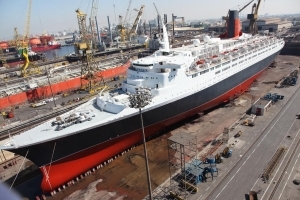 In a news conference held at Drydocks World Dubai, chairman Khamis Juma Buamim provided more details and status on the plans to reactivate the Queen Elizabeth 2 as a floating hotel. The current plan is segmented into 3 parts. Part 1 - the Queen Elizabeth 2 (QE2) will be mechanically prepared to sail for Singapore and China. She is currently drydocked at the Drydock World Dubai Facility. Work currently being completed includes over-hall of her engines, navigation equipment and structure to assure her seaworthiness. Just recently she was provided her classification and ocean going certification. She is expected to depart Dubai on October 18th. It is anticipated that a crew of 32 will sail the ship to Singapore where part 2 will begin. Part 2 includes the removal of artwork and historic memorbilia which will be stored in a warehouse until the accomodations are rennovated. The Queen Elizabeth 2 is expected to arrive in Singapore on November 1st and stay for three days. Next the ship will head to Hong Kong where she will dock briefly (estimated at 3 days) before heading to a yet to be determined shipyard in China where she will be converted in an all Suite hotel. Internally she will be reconfigured to 400 suites ranging from 60 square meters to 150 square meters. The renovation is expected to cost $90 Million Dollars. After the refit is complete, she will be relocated to a yet to be determined site in Asia, where she will serve as a stationary hotel. Current speculation has Hong Kong, Shanghai or Singapore as possible sites. The QE2 has sit idle in Dubai for more than 4.5 years and is expected to have a royal send off as she steams from Dubai under her own power on October 18th. Queen Mary 2 Celebrates Her 200th Crossing. 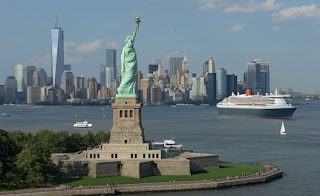 July 8, 2013 – Cunard Line’s flagship Queen Mary 2 is making her historic 200th Transatlantic Crossing, having sailed from New York on Saturday 6 July en route to her homeport of Southampton, England, arriving 13 July. To mark the beginning of the historic voyage from New York, Queen Mary 2 performed a sail-by of the world’s most iconic statue atop Liberty Island. On board are keynote speakers presenting talks about the ship’s design, as well as special Big Band performances, and a celebratory Gala Dinner to be held on 11 July. In the course of Queen Mary 2’s 200 Transatlantic Crossings, Cunard Line estimates that a half-million passengers have consumed 8.4 million cups of tea; 980,000 scones; 481,000 bottles of champagne; 644,000 eggs; and 253,605 gallons of milk. In total, 22.4 million meals have been served over 600,000 nautical miles, excluding the ship’s annual World Cruise and sailings to the Canaries, Fjords, Iceland, the Low Countries, around Britain, up to Montreal and Québec in Canada, and among the Caribbean islands. Also noteworthy, over the course of Queen Mary’s 200 Transatlantic Crossings, more than 1,000 dogs have been pampered in the only kennel facilities aboard a passenger ship. To commemorate the 200th Crossing and as part of the line’s award-winning Cunard Insights on board enrichment programme, Stephen Payne OBE, who was largely responsible for the overall design of Queen Mary 2, is presenting a fascinating insight into the ship’s construction. He will also be guest of honour at the formal Gala evening dinner on 11 July. "Queen Mary 2 embodies the attributes of a true liner, including reserves of stability and deep draught. Combined with her great size, these attributes ensure that the ship can achieve a level of Atlantic sea-keeping superior to any other liner in history,” said Payne. “No other passenger ship is as much at home on the North Atlantic as Queen Mary 2." Also speaking during the milestone Crossing is BBC newsreader and Classic FM presenter Nick Owen; and getting into the swing of things are a dozen musicians, plus a band leader and vocalist from the world-renowned Juilliard School of Dance, Drama and Music. The group is performing as a jazz orchestra, providing a selection of Big Band, Swing and Glen Miller style music and smaller ensemble pieces. They will perform at an evening event in the Royal Court Theatre with full orchestra and vocalist, an afternoon tea dance, lunchtime jam sessions featuring an ensemble in the Chart Room, and a late evening ensemble in Illuminations. In addition, two jazz masterclass talks and a Q&A are being held with the bandleader and members of the orchestra. "Every Crossing has its moments, as no two are ever the same,” commented Queen Mary 2 Hotel Manager Robert Howie. “The beauty of Transatlantic Crossings is the elegance of our guests, the fact that you seem transported back in time, and even the unpredictability of the weather." Howie continued, “Guests marvel at how the ship handles the varying weather and this is when Queen Mary 2 comes into her own, performing at her best – it’s what she was designed for. All of us who work on board feel immense pride when she is acknowledged throughout the world with fantastic arrivals and departure celebrations. No other ship in the world has that recognition." New York, Boston and Norfolk Lose Ship As Carnival Cruises' Announces Carnival Glory to Relocate to Miami Year-Round. 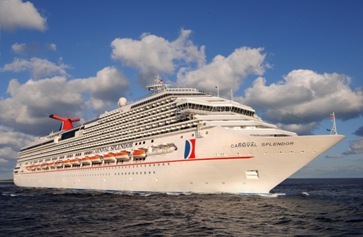 Carnival Cruise Lines has announced that the Carnival Glory will sail from Miami Year-round starting November 2013. The changes are being driven by new fuel emissions regulations which go into effect, that require ships operating in US and Canadian Territorial waters to burn a special low-sulfur emission fuel. The special, low emission fuel is not readily available in large quantities and is very expensive. Many cruise lines are fitting their ships with 2 sets of fuel tanks so they can consume the low-sulfur fuel when in terratorial waters and cut over the to lower cost, fuel when deep sea cruising. The retrofitting of fuel tanks is currently not planned for the Carnival Glory. Since her itineraries from Boston and New York keep her in territorial waters for most of the voyage, the cost to operate on these itineraries will significantly increase. The Carnival Glory's previously announced 2014 itineraries had her sailing from Boston to Canada on 4 and 5 day cruises until mid-summer and then relocated to New York for 4, 5 and 7-day cruises to New England and/or Canada. Finally heading south in October to Norfolk for a short series of cruises. For Norfolk, this is particularly bad news because the Carnival Glory is the only cruise ship to regularly call at the Port of Norfolk. Reports out of Boston and Norfolk are stating that legislators are appealing for an exemption for Carnival Cruises to operate the Carnival Glory on the previously announced itineraries. It is unclear whether Carnival would reconsider if they were to receive a temporary exemption. As of now the Carnival Glory will not be returning to Boston, New York or Norfolk in 2014. 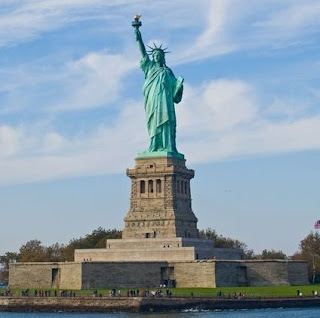 Statue of Liberty Open For Tourists. After being closed for almost 9 month, the Statue of Liberty was re-opened to tourist today. The island was extensively damaged as a result of Hurricane Sandy. The island received significant damage after the rising Hudson River flooded the island destroying walkways, electrical systems and sewerage management systems. The island is now open and additional details about obtaining tickets can be found here - StatueCruises.